This is a two parts series in discussing incremental import job in sqoop. This post is the first part of the series. 3. Load Data to Hive Table. 5. Export data from Hive table to Oracle Database. 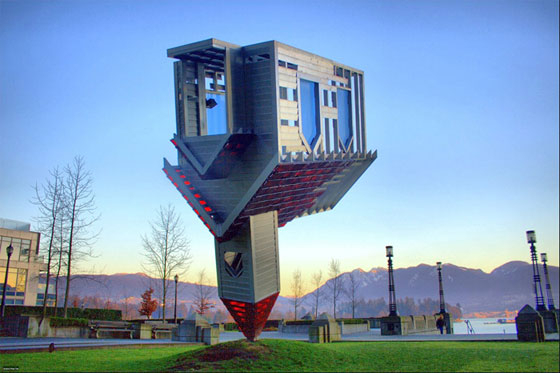 When using sqoop to load data to hive table from an Oracle table, it’s not always loading a full table to hive in one shot, just like taking many days’ work to build the house below. In other words, it is common to load partial data from Oracle table to an existing Hive table. This is where we need to use sqoop incremental job to do the work. First, I create a simple table to illustrate the process for incremental import. 1. Create the source table. Run the following query to create a new table on Oracle database. 2. Create the import command. check-column argument specifies which column to be checked during the import operation. The column can not be *CHAR type, like VARCHAR2 or CHAR. incremental argument can have two modes: append and lastmodified. Lasmodified argument is usually used with a lastmodified column defined as timestamp. Last-value argument is used to specify a value that new rows with greater than this value will be insert. If seeing the following error, make sure the tablename specified in –table argument in UPPERCASE. If it is lowercase, you could see the error below. ERROR tool.ImportTool: Imported Failed: There is no column found in the target table all_objects_inc_test. Please ensure that your table name is correct. If using –hive-import argument, you could see the following error. It is not supported yet. So have to remove it and build Hive External table after complete the import data to hdfs. ERROR Append mode for hive imports is not yet supported. Please remove the parameter –append-mode. 3. Execute the Table Import to Hive. 15/09/25 05:14:22 WARN tool.BaseSqoopTool: Setting your password on the command-line is insecure. Consider using -P instead. 15/09/25 05:17:33 INFO mapreduce.ImportJobBase: Retrieved 4 records. Notice there is a line of –last-value 4 at the end of execution. This is correct as I imported only 4 rows. The result file is under /user/wzhou/STUDENT. Let’s verify it. Result looks good so far. 4. Create Hive external table. The new hive external table on Hadoop is still under test_oracle database. 5. 2nd Round of Insert. Let me to test out more insert to see how incremental import works. On oracle database, create a few more rows. 6. Rerun the incremental import command. 15/09/25 05:39:51 WARN tool.BaseSqoopTool: Setting your password on the command-line is insecure. Consider using -P instead. 15/09/25 05:39:51 INFO oracle.OraOopManagerFactory: Data Connector for Oracle and Hadoop is disabled. 15/09/25 05:42:54 INFO mapreduce.ImportJobBase: Retrieved 7 records. Interesting, the result is not what I expect. I expected only three rows will be inserted. But it seem all 7 rows are inserted. Let me verify the result. Ok, let me look at the result from Impala. Interesting. Impala shows 4 rows instead of 11 rows. The reason is that impala does not refresh metadata regularly. So need to do the invalidate metadata to get the last row count. Hive doesn’t seem have this issue. 7. Solution to fix this issue. The solution is to add one more argument, last-value, to specify where the load stop last time. I redoed the step 1 to 5. Ok, everything looks good right now. Although Hive is popular in Hadoop world, it has its own drawback, like excessive Map/Reduce operations for certain queries and JVM overhead during Map/Reduce. Impala is designed to improve the query performance accessing data on HDFS. Hive is SQL on Hadoop while Impala is the SQL on HDFS. Hive is using MapReduce job to get the query result while Impala is using the its daemons running on the data nodes to directly access the files on HDFS and don’t use Map/Reduce at all. 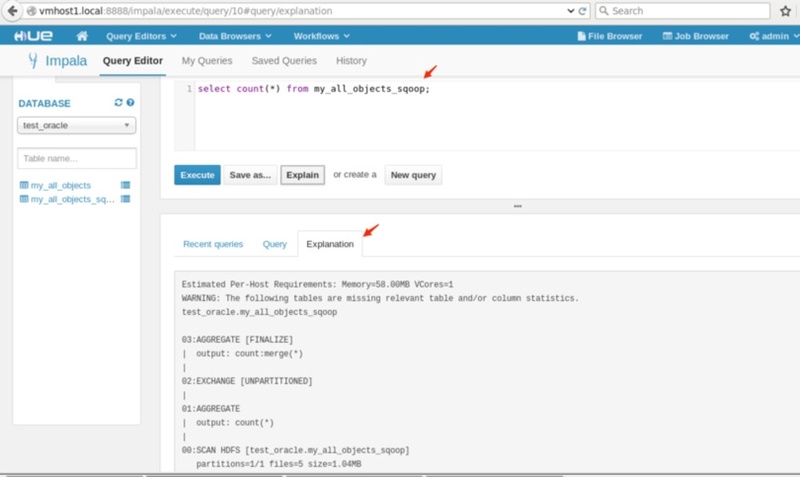 There are two ways to use Impala to query tables in Hive. One way is to use command line, Impala Shell. Another one is to use Hue GUI. I am going to show both methods one by one. Impala Shell is a nice tool similar to SQL Plus to setup database and tables and issue queries. The speed of ad hoc queries is much faster than Hive’s query, especially for queries requiring fast response time. Here are the steps in using Impala shell. 1. Logon as wzhou user and start the impala shell. Note: The prompt shows Not connected. I need to connect the Impala shell to any Data Node with impalad daemon. My cluster is using vmhost2 and vmhost3 as Data Node. So I pick any one of them, use vmhost2 for this test. 2. Run some queries. Impala can see the same list of databases and tables like Hive does. 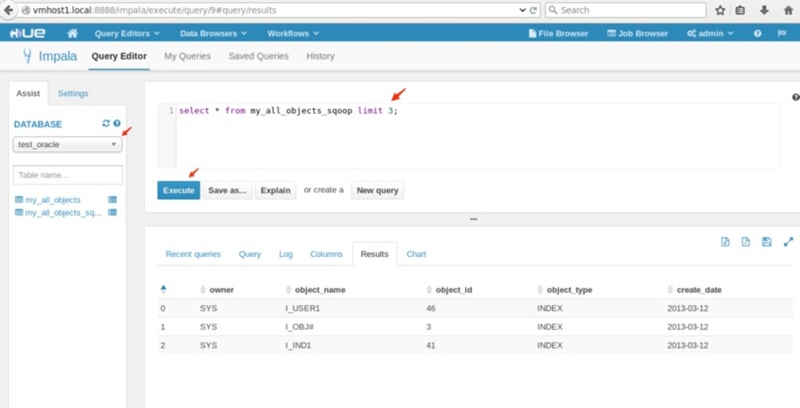 Another way to use Impala is to run query from Hue UI. 1. 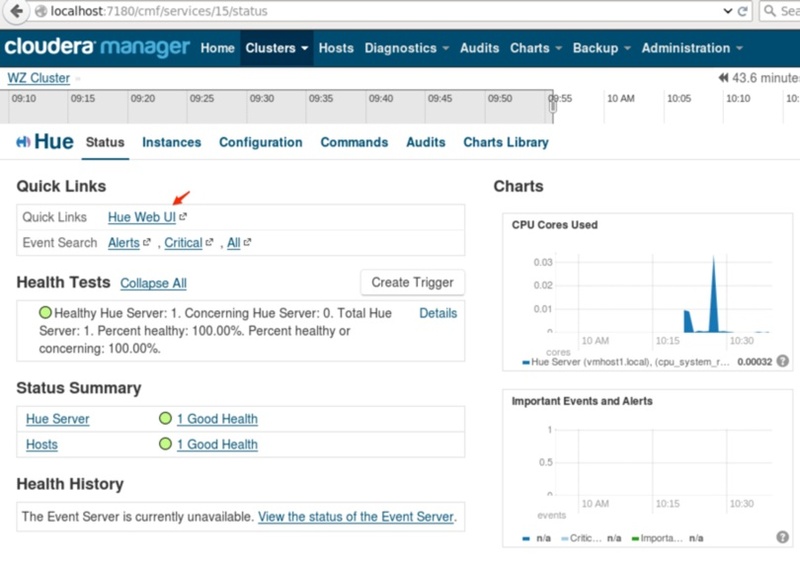 From Cloudera Manager screen, click Hue. After Hue screen shows up, click Hue Web UI. 2. 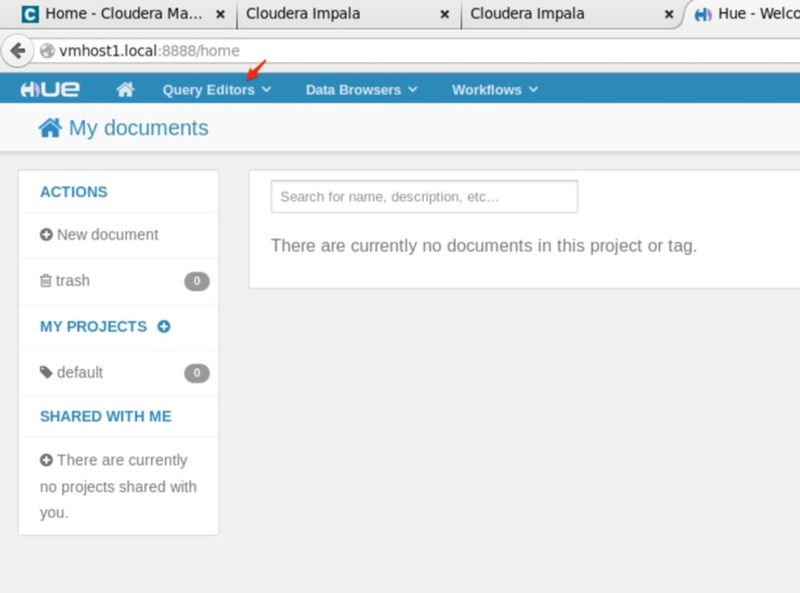 On Hue home screen, click Query Editors, then choose Impala. 3. After Impala Query Editor screen shows up, select test_oracle under DATABASE. Input the following query, then click Execute. 4. Run another query and check out Explain plan. Wow, 41 seconds to get a row count of 22,782 by using Hive. That seem excessive on a cluster no other jobs running. Ok, let’s look at Impala’s result. The above result shows Hive took 41 seconds to get the row count of a table with 22, 782 rows while Impala was significant faster and took 0.12 seconds. I know my cluster is small, not powerful and hive is using Map/Reduce. But getting a total row count of 22,000 needs 45 seconds, it seems too much. On the other hand, Impala’s timing looks more reasonable to me. Obviously Map/Reduce is not my option if I want to run some queries that expect fast response time. But if executing a long running job against a huge dataset, Map/Reduce option might still be on the table if considering job fault tolerance.